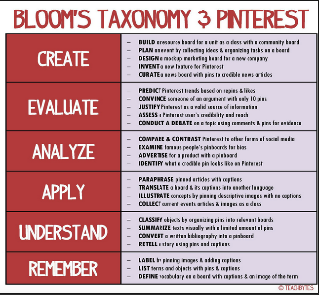 Folks in Teachbyte have just released this awesome graphic relating Bloom's Taxonomic thinking levels to Pinterest. Note here that this graphic is based on the Revised Bloom Taxonomy that was published in 2001 and not on the original taxonomy introduced in 1956. As you probably know there are some slight differences between the two versions. In the original Bloom's Taxonomy, Benjamin Bloom used nouns to refer to the different thinking processes in the cognitive domain, thus resulting in a classification that reads as follow: knowledge, Comprehension, Application,Analysis, Synthesis, and Evaluation. In the Revised taxonomy, Anderson and Krathwohl used verbs in stead of nouns: Remember, Understand, Apply, Analyze Evaluate, then Create. Apart from this semantic difference there is also another difference at the level of sequencing and ordering the elements in each thinking continuum. Synthesis was replaced by creating and creating was placed at the top of the taxonomy while in the original taxonomy, evaluation was the highest order thinking skills.